Experienced defender Paul Robinson insists Tyler Cordner has made the right decision to stay with the Hawks for the rest of the season. 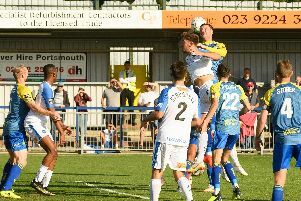 AFC Bournemouth loanee Cordner committed to continuing his football education at Westleigh Park by extending his loan. It was feared the young defender might be lured away by a Football League club during the January transfer window. A number of scouts were in the stands watching the 20-year-old at the Dover game. He produced another outstanding performance and the club were concerned they might lose his services. But despite having offers to move to a higher level Cordner opted to stay with the Hawks. Former Pompey, AFC Wimbledon and Millwall defender Robinson feels the youngster will benefit from this in the long run. He said: ‘It is a really great move for all concerned. ‘For Tyler it means he gets the best of both worlds. ‘He gets full-time professional training with Bournemouth during the week and competitive football with the Hawks at the weekend. ‘Tyler has done well since coming to us and played an important part in the side. ‘He has grown in confidence, adjusted to the level, and is starting to use his physicality. ‘Thankfully now we have him for the rest of the season. ‘He is learning the game in the best environment against good teams. Cordner has produced a string of outstanding performances. Against Dover he had to assume even greater responsibilities after fellow defender Chris Robertson was sent off in the first half. Robinson felt the Bournemouth talented really impressed when the Hawks were under pressure. He said: ‘Tyler stood up to be counted when the chips were down. ‘He showed a great level of maturity, doing lots of talking to organise the defenders around him. ‘Since coming to us he has settled quickly and is happy within the environment. The Hawks make one of their longest trips of the season next when they travel to Gateshead on Saturday, February 9. Three days after that they go to Fylde. 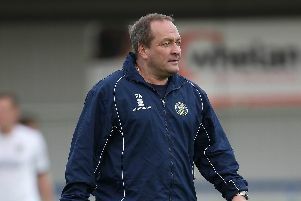 Robinson added: ‘We have big games coming up against some big sides. In midweek the Hawks booked themselves another Portsmouth Senior Cup final at the end of the season. They romped to a 7-0 win against Hampshire League Paulsgrove. Either Moneyfields or AFC Portchester will face them in the final at Fratton Park.